ROBOTIS is looking for DYNAMIXEL XL-320 Beta testers! 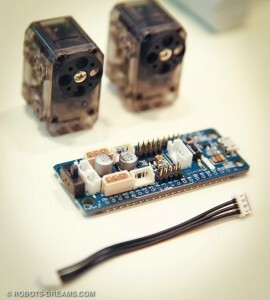 ROBOTIS has posted a news article asking for applicants to beta-test their new XL-320 servos. These new servos are similar to the AX-12A servos, working with the DTYNAMIXEL data packet, allowing you to set position and speed of the servo as well as retrieve positional data, temperature data and more! You can even set the compliance slopes on the servo, just as you could with an AX-12A. The new servos are smaller than AX-12As, making them great for projects like ROBOTIS’s mini-darwin project. To apply for the beta program, ROBOTIS has asked customers with DYNAMIXEL experience to share the news post on facebook and describe what makes them a good candidate for testing the XL-320. 10 teams/individuals will be chosen by ROBOTIS. Beta testers will receive 2 XL-320, a CM9 control board, 2 Li-ion battery packs, a charger and several OLLO pieces. There is no release date for the XL-320s as of yet, but we’ll keep you posted on any news!